I would like to thank Alli from The Vintage Postcard for honoring me with a Vintage Reel Award, which she created as a way of recognizing fellow bloggers in the blogging community. It’s always nice to get a shout-out from one of my peers, and the award is a great way to encourage interaction among bloggers who share common interests. 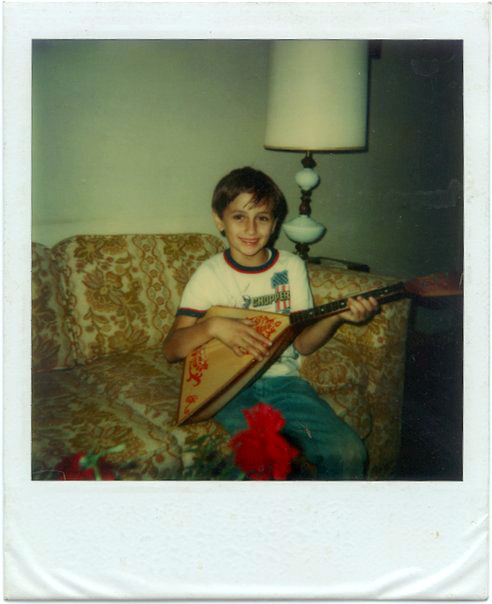 This picture of me posing with my balalaika was taken circa 1979. I chose this one because it foreshadows both my love for music and my passion for travel, and also because it ties in to my third response below. My Uncle Kipp brought this back from one of his many trips to Russia. I loved it and played it all the time–until, being the klutzy kid that I was, I broke it. If I recall, the neck snapped in half, but I don’t even remember how it happened. It would not be my last mishap with a gift from my uncle. One year he gave me an authentic Swiss army knife, which my parents promptly confiscated after I sliced my thumb open. But I still have that knife and frequently make use of it (it came in handy during my hike of the Inca Trail last year). Overall, what this photo represents to me is how, from a young age, my uncle made me aware of a world beyond the one outside my front door. It wouldn’t be until my 36th year on this planet that I would finally make my first trip overseas, but the seeds were planted way back then. I had a wonderful childhood so it’s tough to pick just one memory, though standouts include road trips with my family and summers spent camping. However, in keeping with the theme of travel and adventure, I’d like to recount one summer afternoon from my childhood in Clayton, NJ when my friends and I decided to explore the forest across the street from my house. We had ventured into those woods before, but never far. This time we were determined to keep going all the way to the end, wherever that may be. There was no path to follow so we just chose a general direction and off we went, forging our way into the unknown. We met every challenge that crossed our path, including a wide stream that we traversed by climbing a tree that was bent over the stream. Imagining ourselves as cool survivalists, we even drank from a running stream that one of us claimed was clean because the water was running over rocks–lord knows what pathogens I picked up that day! Describe how you were as a child and how you are now. Are you pretty much the same in terms of what excites you and interests you? As I approach my 42nd birthday I’m every bit the kid at heart I was at 12–and my wife might even say I’m still at the same level of maturity. 🙂 Most of what moved me then still moves me now: Star Wars, dinosaurs, outer space, history, music, sports, nature, the wonders of the world, a good book, film, or TV show that takes me to another world . . . did I mention Star Wars? Who is that person in your life that you couldn’t live without? I also have to give a shout-out to my Uncle Kipp, a pro traveler if ever there was one, who introduced me to traveling and gave me the confidence to travel alone in foreign countries, culminating in my first ever solo overseas flight to Peru last year. He has been my travel buddy for all four of my overseas trips. Without these two people in my life, the closest I would ever have gotten to the wonders of Europe and South America would have been via my television set. I think time is always the biggest issue given how few vacation days the average full-time employee gets here in the States in comparison to our counterparts in many other countries. An epic trip like I took to Peru last year uses up the majority of my paid time off, and the month-long trip I took to Europe in 2011 would not even be possible now (I had been a contract worker during that time, so I was able to take over a month off without pay). The other barrier is my disdain for air travel. I’m not afraid of flying but I hate the hassle of it, so I have to psyche myself up for that portion of any trip. When I travel domestically, I will almost always choose driving over flying, even if my destination is a thousand miles away. I’ve driven from my home in New Jersey to Orlando (twice), Niagara Falls in Canada, Bar Harbor all the way near the top of Maine, and to the Outer Banks and Smoky Mountains of North Carolina. At some point in my life I would like to do a drive across the entire country, and even the multiple days it would take to accomplish that would be less of a hassle than flying. This will have to remain a work in progress as I am still fairly new to interacting with my peers in the travel blogging community and thus have not yet built up a large base of regularly visited sites. But I fully intend to visit the blogs of everyone who has visited mine. I’ve been very impressed with the blogs I’ve visited thus far in terms of their passion for travel and the quality of the writing and photography. I can’t wait to see what the rest have in store for me. In the meantime, I’d like to point all of you back to The Vintage Postcard, an inspiring blog that should be a regular destination for all lovers of travel. Awesome, thanks! 🙂 And thank you for your kind words about my post. I enjoyed sharing these anecdotes and reliving some fond childhood memories. I probably would never gotten around to putting them down in words if not for your prompting, so I’m grateful to you for that as well. Well then I am most happy to have been your prompt! They seem like very great memories. You completely grasped the concept that I was going for with this award, 100%.